An Israeli high court ruling has rejected a request to halt the demolition of a Palestinian West Bank village. Activists fear the worst is soon to come for the settlement of 340 people, which has been fighting over right for land for nearly 30 years. The village of Sussiya in the southern Hebron Hills has been labeled unauthorized by the Civil Administration – the Israeli governing body operating in the West Bank. Residents in the village claim ownership of the land, but are unable to attain the appropriate permits to build any type of housing. The High Court of Justice issued a ruling on Monday, rejecting the request filed on behalf of the Rabbis for Human Rights and Sussiya residents on February 2014 to prevent the planned demolitions. The court stated that it believes that alternative living solutions were available to the Palestinians living there. One of the lawyers from the village, Quamar Mishirqi-Assad, added that Israel wants to move the village settlement closer to Area B of the West Bank and away from the current Area C location, which makes up over 60 per cent of the West Bank. Under the 1993 Oslo Accords, the West Bank was divided into three zones: Area A, Area B and Area C. Area A is secured and governed by the Palestinians, while Area C is under full Israeli control. In Area B, the administration comes from the Palestine Authority, while security is provided by Israeli forces. The survival of the village has been in legal limbo for three decades. The tensions renewed in 2012, when the local administration reissued demolition orders, but ended up not going through with them. However, a group against illegal Palestinian and Israeli Arab buildings, Regavim, called on the High Court of Justice to force the authorities to carry out the orders. The Sussiya community has a long history of struggle with the Israeli authorities. According to reports, the village was initially forced to relocate in 1986 because it was said to be located in the middle of an archeological site. The residents rebuilt their homes just a few hundred meters away from the site, occupying the agricultural land they also owned. Nonetheless, the Civil Administration ended up destroying the village back in 2001. Villagers once again rebuilt their homes, but another 14 buildings were destroyed in 2011. More than 500,000 Israelis live in settlements in the West Bank and around east Jerusalem which were built after the 1967 Israeli occupation of the Palestinian territories. 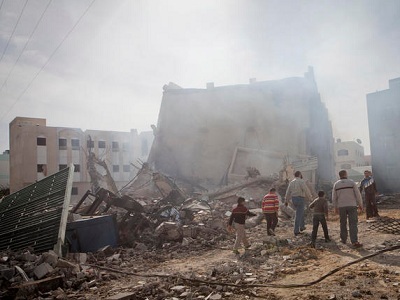 There have been multiple instances of large-scale demolition of Palestinian villages. One of the latest instances includes Israel eyeing 3,176 acres of Palestinian land around a West Bank settlement near central Jerusalem, according to the Ma’an news agency reports. Beit Iksa residents have been given orders, signed by the Israeli military commander in the West Bank Nitzan Alon, to evacuate by 2017. The occupied territories of the Palestinian West Bank and Gaza Strip have been seeking full statehood and independence from Israel for decades. Thousands of people have perished in one of the most prolonged conflicts in modern history. The Palestinians have been granted non-member, observer-state status in the UN and continue to push for recognition. Their April 1 accession to the International Criminal Court marked the Palestinians most substantial step to date in their international legal campaign. The move opens up the door to seek justice for Israel’s operation ‘Protective Edge’ last summer, in which thousands of civilians in Gaza were killed. It also gives them a venue in which to contest the Jewish state’s continuing settlement building.